1) Department of Maxillofacial Surgery, 2) Department of Prosthetic Dentistry, 3) Department of Oral Surgery, Faculty of Dental Medicine, Medical University, Plovdiv, Bulgaria. Decubitus ulcers in the oral mucosa tend to be very painful causing discomforting sensation in patients in speaking and eating. Low energy lasers can provide an alternative method for the treatment of these ulcers. The aim of the present paper was to assess clinically the healing effect of low level laser irradiation on oral mucosa decubitus ulcers. Material and methods: A total of 90 patients with decubitus ulcers were treated in the present study; they were randomly assigned to three groups: group I included 30 patients treated with low level laser (LLL) irradiation (wavelength of irradiation 658 nm); group II - 30 patients treated with laser irradiation of 904 nm; and group III (controls) - 30 patients who received a standard conventional treatment with "granofurin" and "solcoseryl". The treatment sessions in all three groups were administered once daily. The patients in groups I and II were irradiated with focused irradiation at an angle from a distance using a conically shaped light probe 3 mm in diameter. The irradiated area was 0.5 cm2. The light was focused on the oral mucosa ulcer and the surrounding inflamed mucosa at a distance of 0.5 to 1 cm. Diode lasers were used in the study. The dosage of irradiation was 1.2 J/cm2. Results and discussion: The treatment effect was evaluated by changes in the studied parameters: pain intensity, erythema, and epithelialization. They were assessed at baseline, and at days 1, 3 and 5. Conclusions: LLLT administered with the proposed methodology manages pain rapidly and accelerates the process of epithelialization of decubitus ulcers in the soft tissues of the mouth. Lalabonova H, Todorov GR, Daskalov H. CLINICAL ASSESSMENT OF THE EFFECT OF LOW LEVEL LASER TREATMENT OF ORAL MUCOSA DECUBITUS ULCERS. J of IMAB. 2013; 19(4):380-382. doi: 10.5272/jimab.2013194.380. 1. Balyan S, Gerdzhikov I. Adjustment of total dentures and instructions to patients. In: Filchev A. editor. 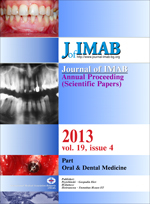 Methodological manual in prosthetic dental medicine. Sofia, 2010:128-142; ISBN-978-954-92666-1-0. [in Bulgarian]. 4. Damyanov D. (editor). Surgery - Basics of surgery. 2nd Edition. Znanie. St. Zagora. 2007; vol. 1:428. [in Bulgarian]. 8. Mosvin CV, Buylin BA. Foundations of laser therapy. Triada Moskow. 2006:256 (in Russian). 10. Peev T, Filchev A. Basics of prosthetic dental medicine. Sofia, ECO-Print. 2008:272, ISBN 954-92284-1-0. [in Bulgarian]. 12. Ryazkova M, Kirova I. Physical therapy - general and special part. ARSO. Sofia. 2002: 46-49. [in Bulgarian].